Looking to add a little adventure to your summer vacation? Travel to the American River, gather up some history about James Marshall’s lucky discovery in 1848 which sparked the California Gold Rush and then head to the white water! Close to Sacramento and the historic towns of Auburn and Placerville, be sure to indulge in the bounty this beautiful region has to offer such as locally grown produce, wine and olive oil. Families can relax in the calm Class II section of the South Fork American starting at Marshall Gold Discovery State Park on our Tom Sawyer Float. For an introduction to Class III rafting, the South Fork of the American is kid friendly and grown up approved for fun and excitement. We offer Express, 1- and 2-Day trips perfect for reunions, corporate events and Bachelor / Bachelorette Parties. The Middle Fork of the American offers Class III/IV whitewater guaranteed to thrill especially when rafting through Tunnel Chute rapid. 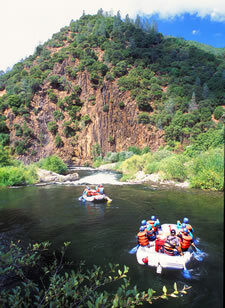 This gorgeous river canyon flows through Auburn State Park and is home to our most popular 2-Day trip. Those looking for an intense spring run river with challenging Class IV rapids should consider the North Fork of the American. The trip meets in Colfax, Ca and it’s best to run this section in late April through May.